We’re all familiar with traditional assets. The share market, real estate, bonds and cash are generally considered traditional investments as they’re well-known and time-honoured. Increasingly, alternative assets are becoming part of people’s portfolios. Alternatives are essentially everything other than traditional assets – though, more accurately, they’re assets that don’t correlate with traditional assets. They can be tangible things such as art, wine (just don’t drink it all! ), precious metals, antiques, coins or stamps. But they can also be financial assets such as intellectual property, venture capital or financial derivatives. So, where do cryptoassets fit in? Cryptocurrency and cryptoassets are seen as an emerging class of alternatives, bought and traded much like foreign currencies. Bitcoin, released in 2009, was the first cryptocurrency on the market. Now there are thousands of coins and tokens to choose from. Unlike central banking systems and their currencies, cryptoassets are typically decentralised, permanently written to a shared ledger – known as a blockchain – to keep track of who owns which assets. In the past, people have often stuck pretty firmly to traditional assets to make up their financial portfolios. They had been a reliable source of steady growth. But then came the global financial crisis of 2008. Suddenly, markets crashed – and so too did many traditional investment portfolios. It’s not a coincidence that bitcoin was released in 2009. Its creation was something of a protest of centralised systems and the bank bailouts that followed the GFC. Historically, alternatives have been seen as more speculative investments – and many are. But there is a big push towards alternatives as a means of diversifying your portfolio, and therefore hedging against another big crash of traditional assets. Alternatives approach financial markets in a different way to traditional investments, meaning they can provide returns that have little correlation with the more traditional approaches. If traditional investments do fall, it should mean that a good, uncorrelated alternative asset remains steady, or goes up in value, or at least doesn’t fall as much. There’s another reason for the move to alternatives – traditional assets may have calmed down since the GFC, but they are delivering lower returns than they have in the past. Often the potential returns for alternatives can be much greater than traditional assets, although they can carry greater risk as well. As an example of how alternatives might fit into your investment portfolio, the investment bank Morgan Stanley suggests investors allocate 22 per cent of their investment into alternative assets to achieve a moderate risk/return profile. Merrill Lynch, another financial giant, suggests that the sweet spot sits around 20 per cent for their typical clients. Basically, adding some alternatives into your portfolio is a great way to diversify – making you a happier, more measured investor! There’s a saying in crypto – ‘going down the rabbit hole’. It’s something that happens to new investors when they start to read about the technology and market – it can be addictive. If we may, let’s go down the rabbit hole, just for a moment. Investing in cryptoassets like bitcoin and ethereum can be a good way to hedge against traditional assets and bring some diversification into your portfolio. But there’s something worth noting when investing in alternatives: your alternatives can correlate with each other. This is where things can get tricky. 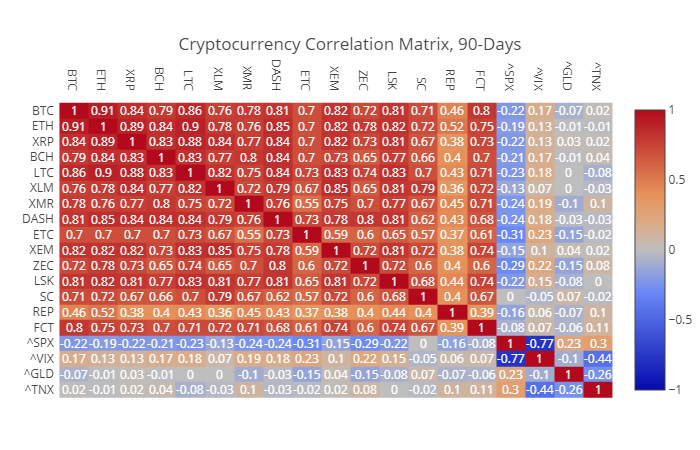 The numbers aren’t so important – if it’s red, it means that cryptocurrency tracks with another. Ideally, if you’re diversifying your portfolio with alternatives, you want to make sure that those alternatives don’t correlate with each other – so your portfolio is truly hedged against any big market swings. That could mean making a diverse basket of cryptoassets, or it could mean holding some cryptoassets and some of the other alternative assets we listed above, or another type of investment entirely. Alternatives are a great way to round out your portfolio – but if you’re looking for a responsible risk profile, they should never make up the whole thing. Tom Surman is a chartered accountant, financial adviser, and CEO of Every Capital, Australia’s first retail investment fund for cryptoassets.